Order within 11 hours 18 minutes for Same Day Delivery! 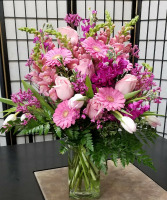 Delight your love with this beautiful bouquet of bright white daisies, precious pink carnations, romantic red roses and more in a radiant red vase. 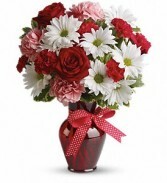 The charming bouquet includes white daisy spray chrysanthemums, pink carnations, red miniature carnations and red roses accented with fresh greenery in a stylish red vase. Approximately 12 1/2" W x 15" H Components may vary. Beautiful red roses are just the gift for the one you can trust, the one you can turn to, the one who loves you above all else and knows your heart inside out. 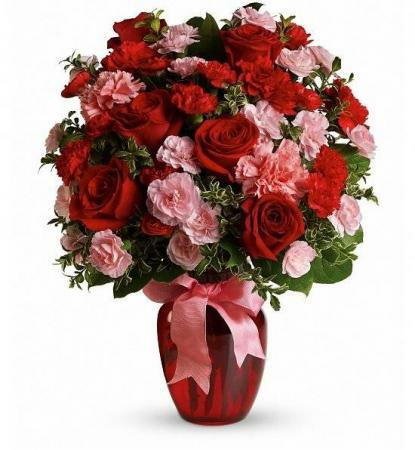 Give the ultimate expression of romance with this stunning arrangement of red roses. 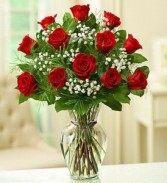 •The freshest long-stem red roses are arranged with fresh baby's breath in a classic glass vase. •A gift of love they’ll always remember--and so will you.